I’ve heard that it works to do “Shrinky Dinks ” from recycled plastic. We’ve just made one attempt so far, but I thought I’d share my how-to results. It’s actually a little hard to find #1 and #6 in flat trays that are easy to use for this craft. I’ve been collecting for a while, and the main thing I’ve found is take-out sushi trays. The three plastics I used looked and felt very similar before cooking, so my son expected them to behave in the same way, but they didn’t! The second batch was #1 plastics cooked on a silicone sheet on a metal pan. Disappointing. They barely shrunk, barely thickened, and several never uncurled. 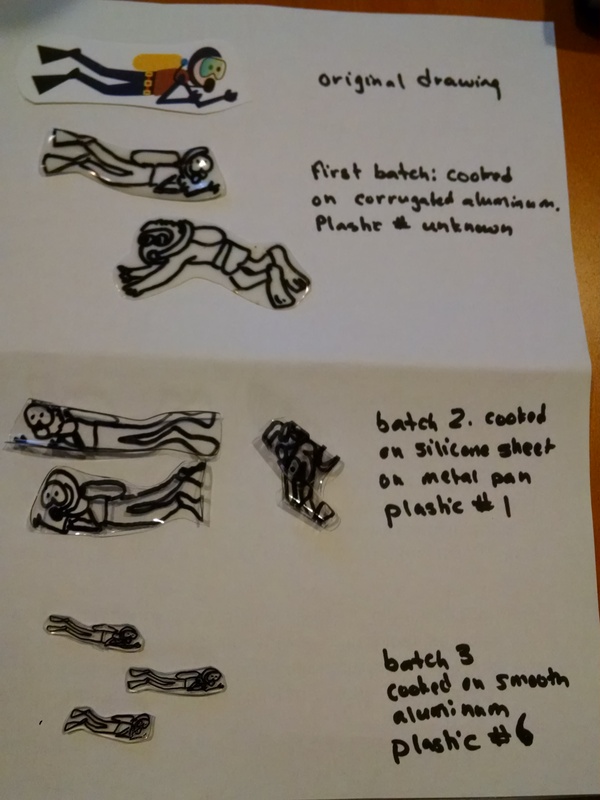 Batch #3 was the best shrinky dink, in that they shrunk well, thickened well, and stayed flat. But they shrunk way more than the others and the end result was much smaller than I wanted. I plan to experiment more with time, but let me know what your results are! This is a fun discovery of various results from similar products. 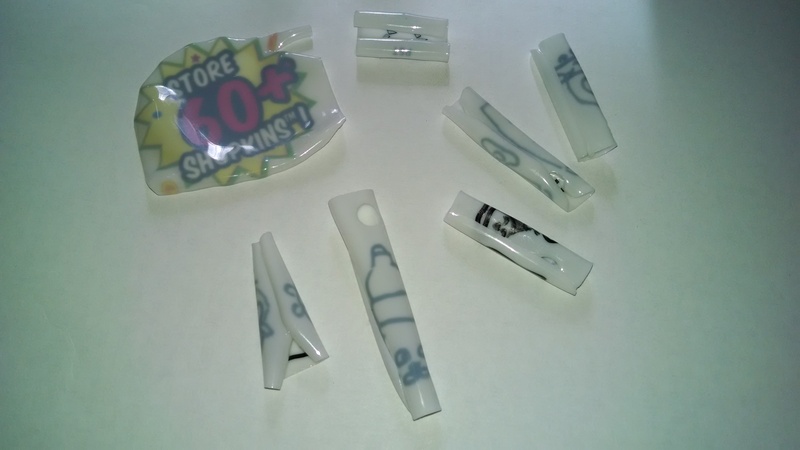 If you really want reliable, consistent results, you’re best off using commercial Shrinky Dinks. At $6 for 10 sheets, they’re a cheap option. Addendum: My son is really into Shopkins, and his new display case came with this packaging. 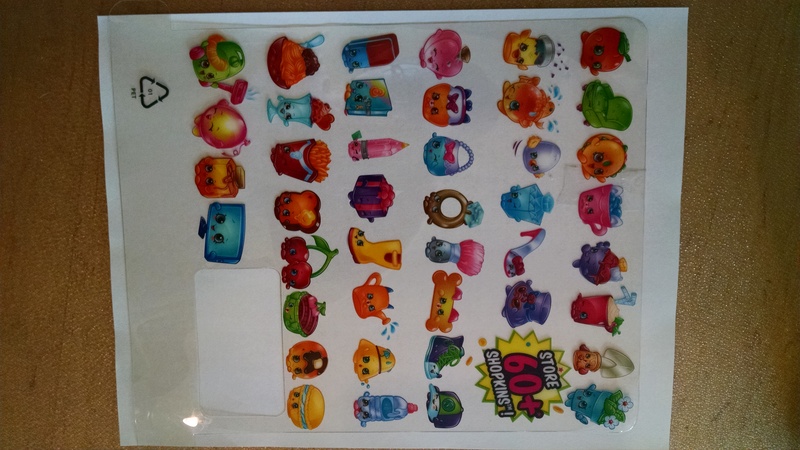 It was #1 plastic, and I had high hopes that we could cut it apart into all the separate Shopkins, punch a hole in each one, shrink it and have small, hard plastic charms. So, we decided to test it. 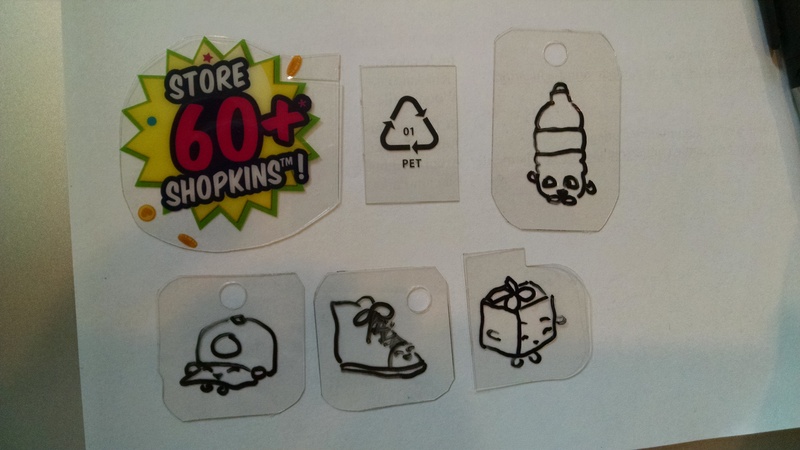 We cut out the “60+ Shopkins” starburst, and the recycling symbol, and we also traced 4 pictures with a Sharpie, cut them apart, and used a hole punch to punch a hole in each hypothetical charm. We heated the oven to 350. Popped them in for a few minutes, They curled up tightly (except the starburst, which just got all rumpled) and turned white and didn’t shrink. We ended up with 6 useless bits of curled plastic. Oh well, back to the drawing board….